Introducing Night Owl’s Extreme HD Add-On 3MP wired infrared cameras compatible with Model# C-841-PIR3MP. 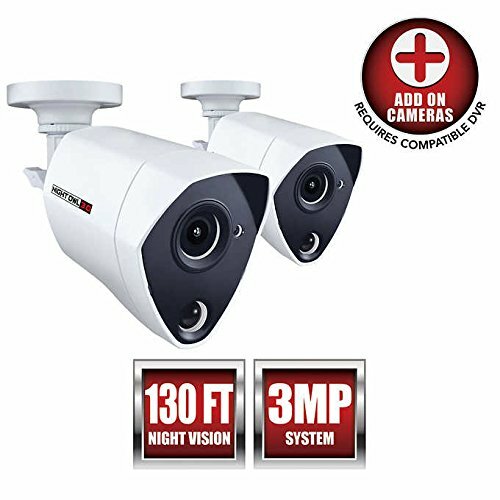 Each camera in this add-on 2 pack comes with an advanced 3MP sensor with 80° viewing angles and up to 130 ft. of Night Vision. They also utilize our state-of-the-art Dual Sensor Technology to reduce false alarms by up to 90%. By incorporating infrared sensors into the 3MP cameras, both motion detection and heat detection are used to minimize false alerts and keep you apprised of real threats in real time. The passive infrared sensor detects changes in heat produced by humans, animals and vehicles. Whereas heavy rain, bugs and changes in lighting could potentially produce motion alerts on older cameras, this new technology requires both changes in motion and heat be detected simultaneously. Not only does this one-of-a-kind technology significantly reduce the number of false alerts you receive, it also conserves hard drive space. (requires compatible Night Owl DVR) This guarantees that you are made aware of those threats that pose the greatest risk to you and your loved ones without having to sift through unnecessary recordings. This truly is innovation right at your fingertips!